Export Business Name, Address, City, State, Zip Code, Website, Email Address, Map Link, Source Link, Category into Excel Sheet with Yellow Pages Spider. 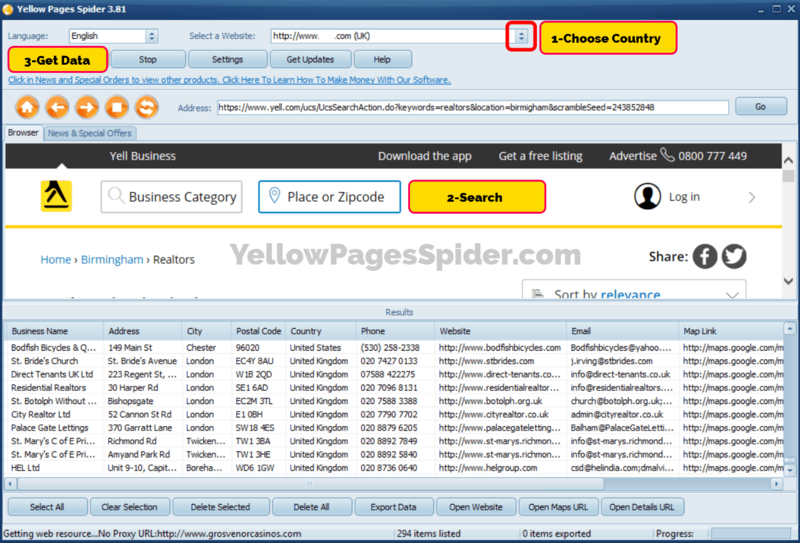 Yellow Pages Spider is a very powerful tool that can research the most famous yellow pages directories and can scrape/extractor important data for instance business name, its complete address, website link and contact details including phone number and email address. With our software, you can easily customize your searches and can extract information as per your needs and can enjoy different features of the target site. All you have to do is to enter a category and Location in the search bar and then just click search, and when you see the first page of searched items you can click “Get Data” button and wait for wonders to happen for you. Yes, when I say wonders, it means that you will not get data in a row form, you will get data in a well-organized manner that you can easily review and can import to MS Excel or your MYSQL database. Not satisfied and want some more options?? Ok… You will get FREE updates with all the packages that will contain updates of new sites and new features each year. If you will have any queries, it will be addressed within 24 hours duration. We don’t run after competing in the market, our focus is to provide best services to our clients and to work on innovation to provide them with better features. Please check out this video to learn more about this software. Do you want to test Yellow Pages Spider? Download trial and try with all the main features. You can only scrape 30 business results in the trial version and we also disabled any export function. [Only 97$ For Life Time]. You will get a package with the Download Link, One user manual & One Full License that you can run in 2 different computers.